Confidence is used to indicate that the contact does not have any dimensions (height or width) > 25mm that implies that it is not an unintended contact. Windows Precision Touchpads should not reject any contacts in firmware processing, but should forward all contacts to the host and indicate the confidence. After a device has deemed a contact to be unintentional, it shall clear the confidence bit for that contact report and all subsequent reports. Until a contact has been deemed unintentional, the device shall set the confidence bit for that contact being reported. With that feature correctly implemented, palm rejection in I2C mode should work. Driver feature development is something we work with our vendors on ensuring they develop, though in this case they won’t since the Microsoft Precision Touchpad specification is a feature that falls outside of vendor-specific needs. Synaptics (or any other touchpad vendor) is unlikely to implement this feature in the Linux i2c_hid driver because it’s not vendor-specific but instead a Microsoft specification. In addition to the recent fixes I posted for the XPS 13 developer edition, here is one more from the team. You can also add the repositories to your /etc/apt/sources.list file manually. 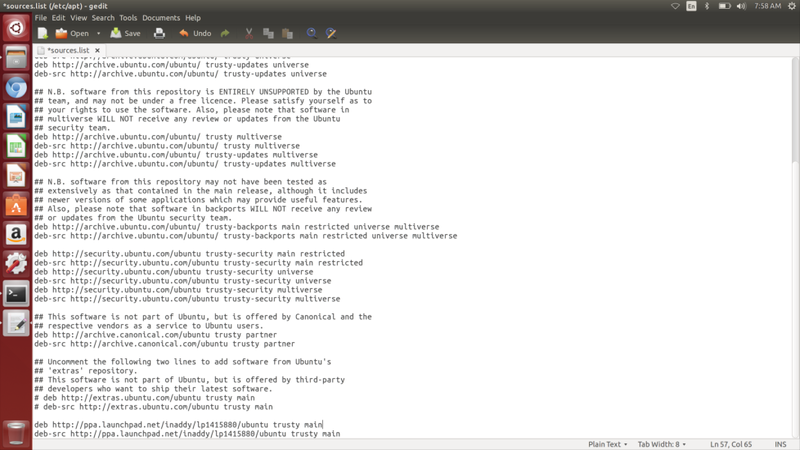 Just add the following lines to the end of the sources.list file as in the screenshot below (requires root access). We are aware of some issues that need to be addressed with our XPS 13 developer edition. While patches have been made available (or coming soon), we are working to add these fixes to the systems at the factory. We apologize for the inconvenience and thank you for your support and patience. Once again we want to thank the entire community for your posts containing feedback and questions to the Dell TechCenter forum and this blog regarding the Ubuntu-based XPS 13 and M3800 developer editions. Last month we posted links to four knowledge base articles addressing: wireless drivers, keyboard repeat, suspend/resume and cursor freezes. Today we are adding three more that have been hot topics recently: creating recovery media, OOBE crashing, and 15.04 UEFI install. So we have all the articles in one place I have also included the previous ones below. Remember, in addition to posting your feedback here, we encourage customers to utilize their support contracts and contact the included Dell support (either Consumer Support or ProSupport, depending on whether you purchased it from the Consumer or Small Business sections). This will help us to officially track issues and tackle them systematically. Please continue to give us your feedback on the Developer Edition systems. In the last few weeks Dell has expanded its consumer line up with additional Ubuntu machines: both the economical Inspiron series as well as the high-end, XPS 13 developer edition. The new economical Ubuntu laptops are made up the Inspiron 14 3000 and Inspiron 15 3000 (14 & 15 denote the screen size) which each offer four configs. All configs of both the 14 and 15 are non-touch. Check them out, you may find one just right for you. We want to thank the entire community for your posts containing feedback and questions to the Dell TechCenter forum and on this blog regarding the XPS 13 and M3800 developer editions (Ubuntu). In response to your feedback, here are the first three Knowledge Base articles focusing on the hottest issues. This post and the Knowledge Base will be updated if new issues crop up. http://www.dell.com/support/article/SLN297219/en [to be promoted to the Dell archive hosted by Canonical – stay tuned].